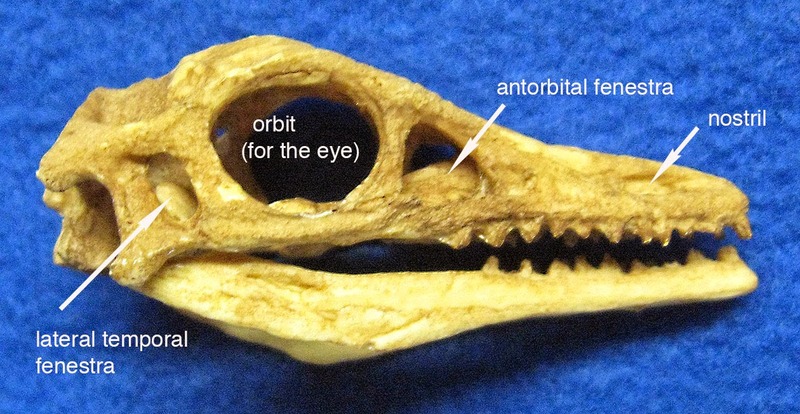 PALEO & GEO TOPICS: Comments by R. L. Squires: Archaeopteryx, a Late Jurassic "dino-bird"
Archaeopteryx, a Late Jurassic "dino-bird"
This post is a continuation of my previous two posts that deal with very interesting fossil skulls of chordate (vertebrate) animals. The first concerned the synapsid mammal Dimetrodon, the second concerned the early dinosaur Herrerasaurus. This current one concerns the "early bird" Archaeopteryx, which is one of the most famous fossils of all time. A replica of Archaeopteryx lithographica. Archaeopteryx lived during the Late Jurassic Period, which was an interval about 164 to 145 million years ago. The animal was approximately chicken size and had several reptilian traits: long, flexible neck that was constructed like a saurischian dinosaur; jaw with sharp teeth; long tail; sternum not keeled; and front limbs with free-clawed fingers. On the original specimen of Archaeopteryx lithographica from Germany, there are faint impressions of hollow feathers. This purpose of this post is not to go into a lengthy treatise on the morphology of Archaeopteryx. Information is readily available online about this subject. Instead, the intent of this post is to show features of its skull that are rarely illustrated in the popular media. These features are a narrow and tapering skull, very much like Herrerasaurus shown in my previous post, and also the presence of two fenestrae (openings) on the top and sides of its skull. The number and positions of these fenestrate are a characteristic of diapsid ("two-hole") reptiles, which include dinosaurs. The openings on top are called supratemporal fenestrae, and the openings on the sides are called lateral temporal fenestrae (see my last post). Side view of replica of skull of Archaeopteryx lithographica, length 4.3 cm. 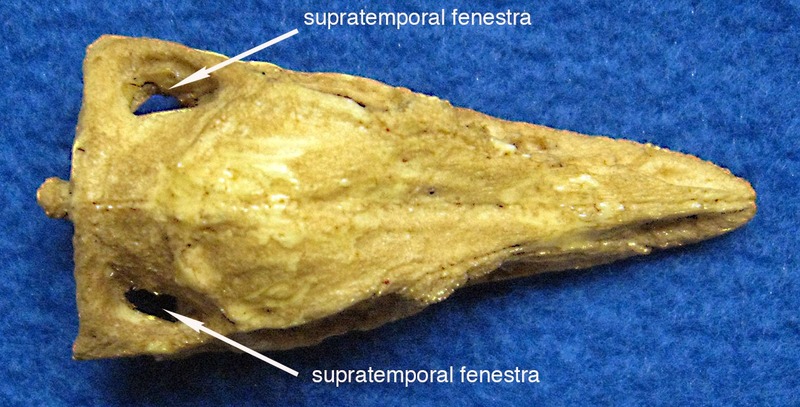 Dorsal (top) view of replica of skull of Archaeopteryx lithographica, length 4.3 cm. Birds are now regarded by most paleontologists as having evolved from feathered dinosaurs (“dino-birds”). This evolution, which was seemingly a very complicated and transitional succession, is likely not to have been a one-step, linear process. Perhaps only one of the many branches of early “dino-birds” survived and yielded modern birds. The story of bird evolution is still unfolding, so stay tuned.